2-IN-1: It is designed to combine the functions of humidity meter, temperature meter, wet bulb temperature and dew point temperature. And Dew point is a measure of how much water vapor actually in the air. BACKLIGHT LCD DISPLY: With a bulb to light up the LCD screen, it is easy to read the measurements in the darkness. LCD brighter in the darker places. MULTIFUNCTIONAL: Unit and mode conversion (°C, °F, dewpoint and wet bulb), Max Hold and Min Hold Function; Auto shutdown without operation after 15 minutes; 6F22 9V Battery included. 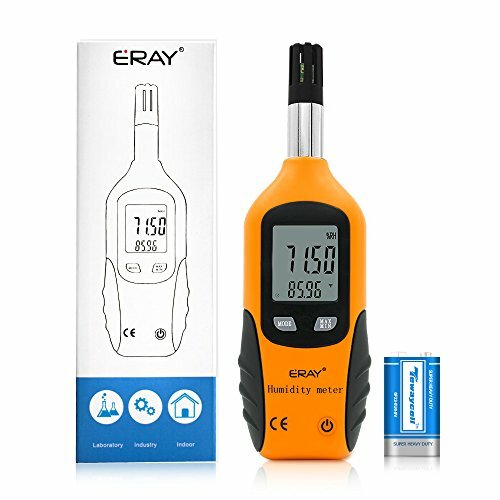 If you have any questions about this product by ERAY, contact us by completing and submitting the form below. If you are looking for a specif part number, please include it with your message.